For a lot of us out there, the world was built a little too big for comfort. Simple tasks that regular-sized folk go about with ease are feats of massive proportions for short people. For starters, you can’t reach the cookie jar, your clothes fit awkwardly, and you can never see at concerts. But worst of all, it’s hard to find a car that can accommodate your tiny height. You know, a car whose dashboard you can see over, whose pedals you can reach, and whose seat can be raised way up. Fortunately for you, we’ve compiled a list of cars for short people to help you find one that fits. Short people don’t have it easy. While assembling this list, we considered such factors as visibility, comfort, driving position, accessibility, and how the cockpits are arranged. In the list, we included sedans, SUVs, crossovers, and luxury vehicles alike. So, whatever you’re looking for, there’s a car here to match your lifestyle, as well as your short legs. Without any further delay, here are the five best cars for short people! First on our list of the best cars for short people, we have the highly acclaimed 2018 Honda Accord. The Accord offers luxury at a bargain price. It has high-end performance standards, a modern design, and excellent safety ratings. As well, the Accord’s layout is very friendly to the short-statured. It has large side windows, and an even larger windshield, giving you excellent visibility from every angle. What’s more, the Accord has a 10-way power adjustable driver’s seat, as well as a tilt and telescoping steering wheel. These features make finding the optimal comfortable seating position a simple task. The 2018 Accord is an impressive car, and that’s reflected in the awards it’s been racking up. It was named Car of the Year at this year’s Detroit Auto Show, as well as AJAC’s Car of the Year, so you know it’s good. 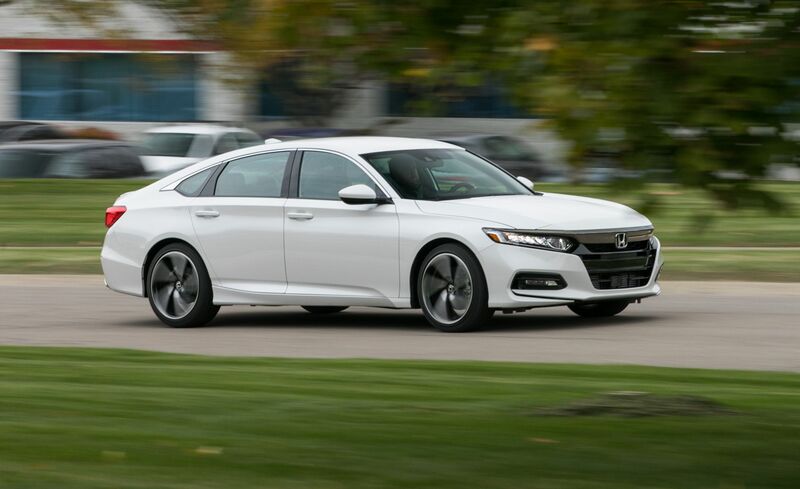 For a closer look at the 2018 Honda Accord, check out our in-depth review. Next up, we have the 2018 Volvo XC90. This head-turning, luxury SUV has capable handling, a strong, dependable engine, and a masterpiece interior. Seriously, the XC90 presents the sort of sophisticated luxury that belongs in a palace. But more importantly, it has a range of features that make it very forgiving for you five-footers out there. Inside, the XC90 has power adjustable mechanics that allow you to set your preferred seating position with ease. Plus, it has contour sport leather seats, complete with cushion extensions that set the golden standard for comfort in vehicles. The driver’s seat, steering wheel, and mirror settings can be saved to a pre-set personal profile, too. That way, after you lend your car to someone tall who changes your settings, you can get things back to exactly the way you like it. Simply press a button, and your seat, mirrors, and steering wheel will readjust to your preferred settings. Additionally, there’s voice-control for the infotainment and climate systems. That means that if you still struggle to reach the controls, you can use voice command instead. Imagine how much easier your life would be if your short, T-Rex like arms didn’t hinder you? The XC90 can make that dream a reality. Another thing the XC90 does exceptionally well is safety. Indeed, it received top-notch crash test scores from the NHTSA (five stars out of five), and was named a Top Safety Pick by the IIHS. In sum, it’s an excellent choice if you value safety, enjoy premium comfort, and want to drive something uniquely tasteful. Oh, and it has three rows of seats, which means it’s perfectly family friendly as well. The word “adjustable” comes up more often in a conversation about the 2018 Mazda3 than it does in a conversation Tom Brady would have about the proper air pressure of a football. Mazda’s figured out the perfect formula for a hot-seller: a near-luxury interior, outstanding driving dynamics, and an affordable price tag. Plus, with features like a tilt and telescoping steering-wheel, and a power adjustable driver’s seat, everyone can enjoy it. Even you, Danny DeVito. DeVito (right) isn’t exactly what you would call tall. In addition to comfortable seating for people of all shapes and sizes, smart pricing, and a premium interior, the other great thing about the Mazda3 is its performance on the road. Thanks to its G-Vectoring Control (GVC) system and available 184 horsepower 2.5-litre 4-cylinder engine, it delivers a smooth, zippy drive. What’s more, the Mazda3 is remarkably fuel-efficient, managing 8.5 L/100km in the city, and 6.2 L/100km* on the highway. If you’re looking for an affordable sedan that delivers a class-above experience, take the Mazda3 out for a test drive. We promise you won’t be disappointed – especially if you’re a bit on the short side. For an in-depth review of the 2018 Mazda3, read our in-depth review. *Editor’s Note: I drive a 2018 Mazda3, and I have personally seen it hit 5.6 L/100 km. The numbers above are just what’s listed by the manufacturer. Another great car to make it onto our list of cars for short people is the 2018 Kia Soul. This highly-rated compact SUV is an ideal choice for drivers who want something fuel-efficient, cargo accommodating, and fun to drive. Its expansive windows, clear forward visibility, and standard height-adjustable driver’s seat ensure a commanding view of the road from all angles for drivers of any height. Entertainment and connectivity features are aplenty in the Soul. Bluetooth connectivity is standard, and there are two touchscreen infotainment screens available – one 5.0-inch option, and one 7.0-inch option. Android Auto and Apple CarPlay smartphone integration are also available. Oh, and all the controls are intelligently placed, so you’ll have no trouble reaching them. Finally, the Soul is one of the more powerful compact SUVs available on today’s market. Its turbocharged 1.6-liter I-4 generates a whopping 201 horsepower and 195 lb-ft of torque. That’s more power than most crossovers it competes against. Your car’s personality doesn’t need to be as small as you are. Give the Soul a shot – we’re positive you’ll love it. Last on our list of the best cars for short people, we have the 2018 Mercedes Benz S-class sedan. The 2018 S-class is the epitome of class and comfort. In addition to over-the-top horsepower, it has an elegant interior, a raft of standard features, infinitely adjustable seats, and the smoothest ride around. If you’re on the shorter side of 5-feet and can afford the price tag, you’ll love the 2018 G90. A heated and cooled 22-way power adjustable driver’s seat (with seating position memory) guarantees you the ability to personalize your seating position to your exact needs. Also, steering-wheel-mounted touch-control buttons allow you to keep your eyes glued to the road at all times. … and that’s just a short list. With this many safety features, you’d have to try hard to wreck the G90. Still, remember to drive carefully. Research and experience point to these cars as the most forgiving to shorter drivers. If you’ve found one you like, contact a Go Auto dealership to schedule a test drive. You can text or call us at 780.777.777, or go online by clicking here. Our automotive experts are here to help you with all your car needs. Oh, and by the way, if you have the opposite issue, and are too tall to fit in most cars, check out our video: Cars for Tall People.